Already August 20th…where does time go??? Well our trip to Michigan was very uneventful, thankfully. Scans showed that Bailey’s spots are continuing to decrease and the one spot in her femur is completely gone…so take that freaking cancer! The spot in her right shoulder area did look a little bigger on the scans, so her Michigan oncologist decided that we need to go ahead and blast it away with radiation so it does not continue to grow. We also discussed plans and options and it was decided that Bailey would continue receiving the same chemo (cyclophosphamide/topotecan for three days every 21 days) she was on, while on the trial study, as her body seems to be responding to it in a very good way and we would just pray that the seizures would stay away since she wouldn’t be receiving the trial drug Nifurtimox anymore. 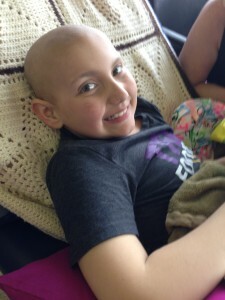 Thankfully when we returned from Michigan it was chemo week (August 5 – 7th) and let’s just say my girl did fabulous! She was able to receive all three days of chemo with no issues, no seizures….ahhhhhh!!!!!! We were even able to go home as planned on day three of chemo right after her infusion was finished. Of course, chemo knocked her counts down and we are having to do a few transfusions of blood and platelets each week to help her body continue to fight but we will not complain about that!!! With that being said, the plan is to continue this chemo for a few more months to see if her body will continue to respond. As long as scans (which will be done after every two cycles) are showing improvement or stable, we will not change anything. Unfortunately Bailey does not qualify for any other trials at this time. Her body has been through alot in 3.5 years and our options are very limited….NOT hopeless just limited! So until something comes along we will continue to take things one week, one day and one scan at a time! Also in other news, school started and Bailey was able to attend! She was a little nervous about going back to school as she wasn’t able to attend very regularly last year and we had a pretty rough year to say the least…but after meeting her teachers her outlook was changed and she was actually ready to go! After her first day of school, I came home to a smiling, beaming little girl that had somewhat diarrehea of the mouth telling me all about her classes and teachers and most importantly her friends. It feels so good to have some normal in life again! For a moment the reality of what our life is really like went away and we were just a normal family talking about normal, non-cancer related stuff….it was a great feeling! I know that as the year goes on her enthusiasm may diminish, as any typical 10 year old would, but for now we will revel in her delight to be going to school as a 5th grader and cherish each and every moment. Well that is pretty much it for now…I will keep you all updated with how the next round of chemo/radiation goes. Until then, please continue to pray that her healing has come and she will not have to endure this cancer battle anymore. Pray for chemo to continue to work, pray for counts to continue to rise and pray for more normal days. Please keep all of our friends who are also in this battle with us…Ashtyn, Tripp, Noah, Tristin, Brooke, Justin, Cierra…just to name a few…and pray for the families of our friends who have recently become angels..Henley and Alyssa…pray that their memories never fade and the comfort of being reunited one day in eternity brings peace. We need a cure so continue to pray…prayers bring miracles and NOTHING IS IMPOSSIBLE!!!! I am so excited to hear that Bailey was able to start school. I am sure she was excited and had so much fun. Can’t wait to hear all about it.